Thanks a lot Andy! you are very kind. Just had a look Uschi van der Rosten UvdR-3 "Rig that thing" Elastic Rigging and it looks promising. For 1:48 do you think standard is enough? or better fine? Cheers for the comments! Great builds!! Thanks for sharing. Beautiful build! thanks for sharing. Outstanding metal finish! Great build, lovely paint job. thanks for sharing. Great Build! thanks for sharing. 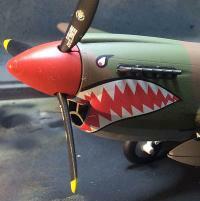 1/48 North American B-25J Mitchell "Air Apache"
another great build from your dad! thanks for sharing. Hi All, After passing the mark of 10 builds (3 for real and 7 test subjects) the newbie here is setting a bit of a challenge and will try to build the RAF Reg Arrow 50th display season (1:48). This one here. My plan is to have it in rest and with open canopy which then requires nice details as it will also be my first aircraft that will have a base. So I thought about asking you guys for suggestions of 2 aftermarket products, a set of seats as this one wont have pilots and a cockpit details set (maybe just the dashboard details would do). Also any other tip about this kit is welcome. I know that it seems like they fixed the issue with the decal which apparently was to thin... Cheers Dema PS if that is not the right forum, please relocate that for me. Yep, great build indeed. Thanks for sharing.